Copyright Chukyo University All Rights Reserved. 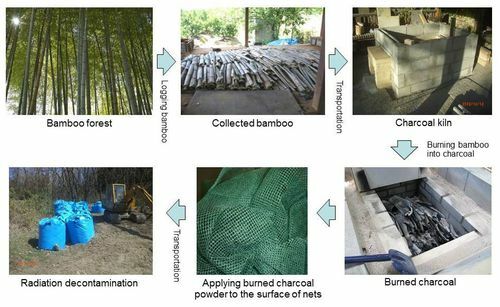 A research group in the Engineering Department of Chukyo University announced experiment results on November 25, 2013, reporting that bamboo charcoal can efficiently adsorb iodine and cesium. In the experiment, the capacities of bamboo charcoal powder and zeolite powder to adsorb iodine and cesium were compared, and bamboo charcoal adsorbed at least five times the iodine that zeolite did, and exhibited 74 percent of the cesium adsorption capacity of zeolite. Currently, zeolite is being used for the removal of radioactive substances released as a result of the Fukushima Daiichi Nuclear Power Plant Accident. There are some problems, however, such as the high production and transportation costs, and the enormous capacity required to store the contaminated water and soil. Assuming the cesium concentration in the contaminated water at the nuclear power plant is 1,200 becquerels per liter, approximately 10 kilograms of bamboo charcoal could adsorb the cesium in 360,000 liters of contaminated water (roughly equivalent to the amount of water in a 25-meter swimming pool). In addition, as bamboo charcoal can be burned so as to concentrate and remove the adsorbed radioactive substances including cesium, it requires less storage space for the contaminated materials. Installing a charcoal kiln on the campus of the university, the research group is pursuing a method for producing bamboo charcoal with excellent adsorption properties. Meanwhile, the group is now developing new products in cooperation with some industries, by making bamboo charcoal into powder and paste and applying them to the surface of nets or non-woven fabrics. Additionally, abandoned bamboo forests have recently become a serious concern for the environment; thus, the use of bamboo charcoal could be a good solution for this problem too, as well as for the removal of radioactive substances, making it possible to get two birds with one stone.